I have not been feeling very glamorous. The days are nice enough: early mornings writing and ‘doing emails’ (when did this become an Activity? ), afternoons tasting (lovely, but quite head-bamboozling) then three evenings a week in lectures mean there’s no time to cook and I get home at 9.20pm and have peculiar dinners such as a raw carrot with a fennel bulb and a bag of Marmite cashews or pizza from the freezer, or Yet Another Plate of Broccoli With Chilli and Olive Oil And Too Much Salt, which I love, and I know it’s a superfood but it’s probably not a balanced diet when it’s practically all you eat. On Sunday I decided another week of this wasn’t acceptable and spent the afternoon making food that could be finished with minimal effort within minutes of walking through the front door. 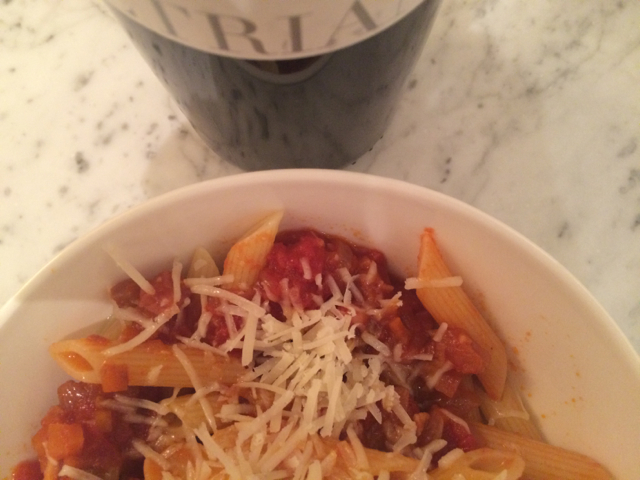 Penne amatriciana (with pecorino grated on it rather than parmesan) is an old stand-by and I mostly made it because I wanted to check out a new sangiovese I had bought at Haynes, Hanson & Clark in South Kensington. I am always on the hunt for good cheap Italian reds – this one is £6.50 – because they are so useful with time-pressed dinners. 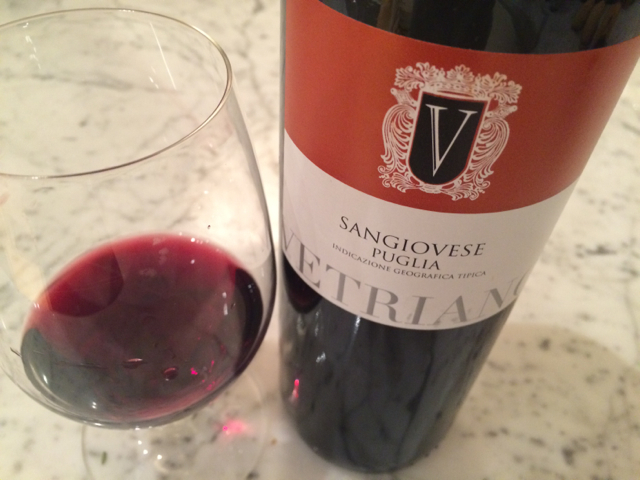 I tried the 2012 vintage of Vetriano Sangiovese in August, got very excited because it was lovely, and stupidly decided not to recommend it until everyone came back from holiday in autumn by which time – it had all sold out. So I bought the 2013 and worried it wouldn’t taste as good….but…winner. It is also lovely. A good buy! Who says independent merchants can’t offer everyday value? What this is: cheery, uplifting, clean and modern. It’s made in sunny Puglia, Italy’s heel, isn’t very scented but tastes generously soft and juicy, with a very gentle twist of that classic Italian sweet-sour flavour, like fat red cherries and violets. What this is not: One of those hairy, mushroom-scented sangiovese that taste of dust and cathedrals and woodland and incense.